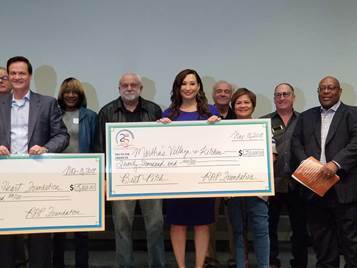 Martha’s Village and Kitchen’s Executive Vice President, Stephanie Minor, was awarded the “Best Pitch” $20,000 prize on Tuesday afternoon from the Regional Access Project (RAP) Foundation at their Desert Fast Pitch Finals, a nonprofit competition held at the UCR Palm Desert Campus. The RAP Foundation’s Desert Fast Pitch is a competitive, five month training and coaching program that helps nonprofit staff succinctly and powerfully “tell their story”. The program helps participants to develop key skills, foster new relationships, gain exposure, and increase their organizations’ ability to attract new resources over time. After weeks of classes, trainings and a preliminary competition, selected finalists presented a 3 minute pitch about their non-profit organization to a panel of judges and audience on Tuesday, November 13, 2018.